Ben was a pleasure and fixed my washing machine efficiently. Everything was professional and friendly. They even let me run an estimate for a different issue by them and gave me free advice. I needed to have the water dispenser fixed in my ten year old refrigerator. I called at 10:30 AM and they had a repair man to my place in a half an hour. He fixed the problem in under twenty minutes. Very prompt and professional. Highly recommended. Although these guys didn't answer my yelp message, I was able to get in contact with them over the phone to schedule a diagnostic of my GE refrigerator. They came the next day and identified the issue. The part I needed was a bit costly, but Ben was able to work out a deal on the labor cost. I appreciated his help and he was very frank about whether it was worth it to repair or just buy a new fridge. I took his advice and repaired, and hope to avoid issues with this unit for years to come. I would recommend this shop as they either charge you $70 for diagnostic if you choose not to repair, or credit the $70 towards the repair if you decide to go with it. Very happy with the outcome. being a new mom with a newborn crying around the clock. The machine no longer leaks and with the new GE parts, the machine cleans better than before. Thanks Alex! Great fast service! Alex arrived earlier than expected and diagnosed the problem with my washer within minutes. He got things up and running again in no time, I would highly recommend for any future repairs. Love Love Love the service. I called Global after reviewing their reviews. And with high hopes of repairing my dryer, Ben came out to assess and repair. Within a short period of time he trouble shorted the problem and got the dryer up and running. He was efficient and friendly. I will definitely keep this company for all my appliance needs. Thank you so much! Great service! Honest, and kind. They came and told me that repairs would be more expensive than buying a new unit and didn't charge me. Did an excellent job fixing my oven! Charged a fair price. Called an got an appointment that same day after work hours. Highly recommended. Honest and efficient. Our fridge was in need of repair, Eli came to diagnose the problem. Repair was done in less time than anticipated. Knowledgeable and trustworthy. Would highly recommend. These guys are legit! Ben came over to evaluate my washer situation and gave me the best advice and told me what would be best to do... and DID NOT charge for the visit. This is good business practice, and so refreshing to experience. These guys definitely deserve their five-star rating. I called up and they expertly diagnosed my issue with my Bosch washing machine over the phone and said that it wasn't worth fixing and I would have to buy a new one. Bosch would have charged me $120 for that, and I would have had to wait a week. I will definitely be calling them again the next time I have an issue. Plus they come to Brooklyn! Businesses like this are a rare gem in NYC. These guys really went beyond the call of duty. I would give them six stars if I could. And get this, due to a vehicle breakdown, they were not even able to come to my house. When their truck broke down, they called, texted and emailed to appologize and let me know what happened. Later in the day, I get a call. It is Eli. He apologized again and insisted on helping me troubleshoot the problem with my range. He walked me through it and in about 15 minutes we identified the problem, the part and a supplier. Later he even sent a link to a youtube video on how to do the repair myself. Instead of a $200 service call, the whole thing cost me $40 and some elbow grease. That is great customer service! Good, reliable service. A very professional company with a very good reputation and not for nothing. Got a recommendation to use their services from my sister in law who was extremely happy with them and they did a great job with my refrigerator as well. I know refrigerator repairs usually cost a lot but this company is truly honest and therefore the prices are reasonable. I will always give a good review for a business that offers good service for a good price, it's not so common. I highly recommend. Global Solutions stands behind their repairs. My three-year-old KitchenAid dishwasher stopped drying. Global Solutions fixed the problem. This part was expensive, and I considered just buying a new dishwasher. But I went with the repair since the machine was relatively new. So imagine my frustration when the problem happened again, less than three months later. But Global Solutions honored their guarantee and replaced the faulty part. I'm so pleased and won't hesitate to call them again when the next appliance breaks (as appliances inevitably do). 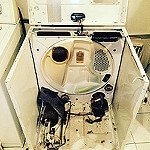 Alex repaired our LG washing machine. He responded quickly to my phone call, and made it easy to schedule an appointment. He was on time, friendly, and professional. He discovered a tear in the rubber door seal, and ordered a new one for us. Our machine is stacked in a small closet, and to my relief, Alex was able to install the ring without having to remove the machine from the closet or unstack it. His price was fair for the work he did, and I will absolutely call him the next time we have an appliance that needs repair! Needed to have our GE dishwasher checked out, and searched on Yelp for some customer reviews and recommendations. Global Solutions Repair truly earned their 5 stars rating without a doubt. "Alex" was knowledgeable, efficient and courteous. He arrived a little earlier than the timeframe which was great , giving us more time to do other errands before the day ends. I will definitely call them in the future and you should too! You won't be disappointed. Eli came in on a Sunday because I have a busy schedule. He was honest, professional and kind. Fixed my oven in no time and it works perfectly now. I would recommend those guys to my friends.The woman on the phone was also very nice and patient. Thumbs up all accros the board! I called Global Solutions Appliance Repair for a Sub Zero refrigerator repair. The refrigerator was on the fritz and Ben was very helpful. He was knowledgeable and kind and answered all my questions. Setting up the appointment was a breeze, the woman I talked to on the phone was very professional and pleasant. I had a bad experience with a previous appliance repair company so I was very suspicious but I was pleasantly surprised. Ben replaced the compressor and did so perfectly, seemed like a hard job. I will definitely call them again. My fridge started having the same issues this past summer. I contacted them a few days later after the year warranty had expired. Global Solutions came to take a look and said they would have to perform the same work but would have to charge me (almost the same amount I had paid previously). Not to say that that the work Global Solutions did was faulty (could have just been a bad fridge), but it would have been good customer service to honor the warranty since it was a few days over. I ended up purchasing a new fridge. This week our washer stopped draining so we again called Global Solutions! Scheduling an apt was a breeze and the technician arrived on time (even remembering us from the fridge visit noted above). An hour later, our pump has been replaced and we are back in service! As new home owners in the area, Global Solutions is our go to for appliance repair. Fast Reliable service! Friendly customer service. Dyers drum would not stop even when the machine was off. Alex Was able to fix my machine and it now works like new. Thank You!!!!! Definitely will recommend to family and friends! I had the pleasure of using their service today. Setting up an appointment via yelp messaging was a breeze, and they were very accommodating with my schedule. The technician called a couple of times informing me of his estimated arrival, and he arrived promptly during the scheduled time slot. Upon arrival, I found him to be courteous and professional. He was able to quickly diagnose and pinpoint the problem with my dishwasher, and fixed the problem before I even noticed it. The technician made sure the floor was dry and clean before he left my home. Over all, I'm happy with the work and will not hesitate to use their service again. This company is amazing!! They were able to send a technician out as fast as the next day. Ben has helped us out on 2 separate occasions. He was able to figure out the problem quickly and knew exactly how to fix it. He is very knowledgeable, professional, and does the job quick and efficiently!!!! Would recommend this company to anyone in need of appliance repairs!! They were able to send a technician to help me in a couple of hours. He does a very good, quick, neat and clean. I have no complaints. Service was fast, expert and friendly. I needed someone to come out and look at my ventless dryer (Bosch) which went out on Monday before Thanksgiving. The repair was scheduled for Tuesday, and the repairman was right on time. I didn't catch his name, but he was very nice and very knowledgeable. He fixed the machine quickly, got on great with my dog (who is a valuable assistant in all things--see below) & even took the time to show me how to clean it. Highly recommended! Ben came Friday afternoon to inspect my GE fridge that broke down and he had to order a part because he didn't have it in his inventory. He had it ordered as an over night delivery and Monday he came to repair the fridge which works fine now. He was professional, friendly, focused and always came on time. From what I've experienced with this company, they live up to this outstanding rating. Our Bosch dishwasher wasn't draining. I called Global Solutions because they were close by and had excellent reviews. The reviews were entirely justified. They were available the next day--many other repair services have made us wait days, even weeks. Alex arrived promptly, found a serious problem with the motor, and told me what it would cost before starting work. He was clear, professional, worked fast, and told me how to contact him again if there were any problems. He also insisted on showing me the dishwasher was now working again, something other repair services have not done. Highly recommend Global Solutions. Very professional and courteous. Came early and found the problem right away. I will definitely recommend it. I am not happy at all with service provided! It was easy and pleasant to set up an appointment and get someone out the following day but that is where it ends.Repair man sent out was not competent and I believe took full advantage of my senior parents. After supposedly diagnosing the problem of their LG refrigerator he gave them two options to try and fix the potential problem 1) $350 for a part and install, if that didn't work option 2) buy a new refrigerator since replacing a possible compressor issue would "not be worth it". He proceeded to leave their house with mandatory $76 fee and not even write down the LG Model number of the refrigerator so he could order the part. After contacting me a few times to get the model number he calls me back and says "sorry no way to fix this refrigerator part is discontinued, tell them to buy a new one". *** Long story short I contacted another repair service that charged me $20 for replacement part and $75 to install it!!! Instead of shelling out another $2,800 for a new refrigerator. *** Happy others got service with no issues but for us this was not so. I had 2 appliances that needed fixing; a refrigerator & a stove. The stove igniter was defective which was replaced. The freezer defrost thermostat was defective was also replaced. Alex did a great job. He cleaned up after each repair. He called about 30 min prior to arrival. I thought that the price was a bit steep, even with the slight discount. But if it's a good quality fix, then it's well worth it in time & effort in doing it again.